The word white continues Old English hwīt, ultimately from a Common Germanic *χwītaz also reflected in OHG (h)wîz, ON hvítr, Goth. ƕeits. The root is ultimately from Proto-Indo-European language *kwid-, surviving also in Sanskrit śveta "to be white or bright"  and Slavonic světŭ "light". The Icelandic word for white, hvítur, is directly derived from the Old Norse form of the word hvítr. Common Germanic also had the word *blankaz ("white, bright, blinding"), borrowed into Late Latin as *blancus, which provided the source for Romance words for "white" (Catalan, Occitan and French blanc, Spanish blanco, Italian bianco, Galician-Portuguese branco, etc.). The antonym of white is black. The ancient Greeks saw the world in terms of darkness and light, so white was a fundamental color. According to Pliny the Elder in his Natural History, Apelles (4th century BC) and the other famous painters of ancient Greece used only four colors in their paintings; white, red, yellow and black;  For painting, the Greeks used lead white, made by a long and laborious process. 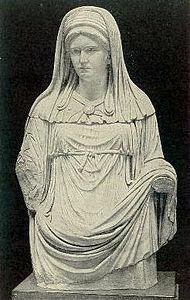 A plain white toga, known as a toga virilis, was worn for ceremonial occasions by all Roman citizens over the age of 14–18. Magistrates and certain priests wore a toga praetexta, with a broad purple stripe. In the time of the Emperor Augustus, no Roman man was allowed to appear in the Roman forum without a toga. 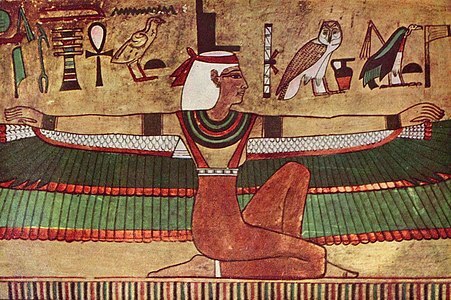 Painting of the goddess Isis (1380–1385 BC). The priests of her cult wore white linen. The early Christian church adopted the Roman symbolism of white as the color of purity, sacrifice and virtue. It became the color worn by priests during Mass, the color worn by monks of the Cistercian Order, and, under Pope Pius V, a former monk of the Dominican Order, it became the official color worn by the pope himself. Monks of the Order of Saint Benedict dressed in the white or gray of natural undyed wool, but later changed to black, the color of humility and penitence. Until the 16th century, white was commonly worn by widows as a color of mourning. 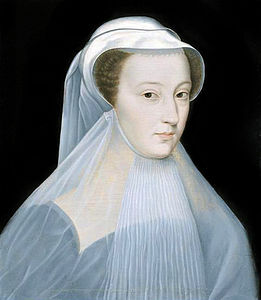 The widows of the kings of France wore white until Anne of Brittany in the 16th century. A white tunic was also worn by many knights, along with a red cloak, which showed the knights were willing to give their blood for the king or Church. The monks of the order of Saint Benedict (circa 480–542) first dressed in undyed white or gray wool robes, here shown in painting by Sodoma on the life of Saint Benedict (1504). They later changed to black robes, the color of humility and penitence. Under Pope Pius V (1504–1572), a former monk of the Dominican Order, white became the official color worn by the Pope. White was the dominant color of architectural interiors in the Baroque period and especially the Rococo style that followed it in the 18th century. 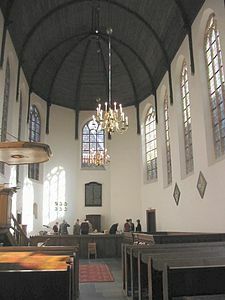 Church interiors were designed to show the power, glory and wealth of the church. They seemed to be alive, filled with curves, asymmetry, mirrors, gilding, statuary and reliefs, unified by white. Portrait of Joséphine de Beauharnais in a classic Empire gown, modeled after the clothing of ancient Rome. (1801), by François Gérard. (The State Hermitage Museum). Symphony in White No. 1 – The White Girl, by James McNeill Whistler (1862). The White movement was the opposition that formed against the Bolsheviks during the Russian Civil War, which followed the Russian Revolution in 1917. It was finally defeated by the Bolsheviks in 1921–22, and many of its members emigrated to Europe. The absoluteness of white appealed to modernist painters. It was used in its simplest form by the Russian suprematist painter Kazimir Malevich in his 1917 painting 'the white square,' the companion to his earlier 'black square.' It was also used by the Dutch modernist painter Piet Mondrian. His most famous paintings consisted of a pure white canvas with grid of vertical and horizontal black lines and rectangles of primary colors. Black and white also appealed to modernist architects, such as Le Corbusier (1887–1965). He said a house was "a machine for living in" and called for a "calm and powerful architecture" built of reinforced concrete and steel, without any ornament or frills. Almost all the buildings of contemporary architect Richard Meier, such as his museum in Rome to house the ancient Roman Ara Pacis, or Altar of Peace, are stark white, in the tradition of Le Corbusier. Poster for the White Army during the Russian Civil War (1917–22). The poster says: "for a United Russia." The Villa Savoye (1928–31) by Le Corbusier; Le Corbusier called for a "calm and powerful" architecture built of steel and reinforced concrete, without color or ornament. Light is perceived by the human visual system as white when the incoming light to the eye stimulates all three types of color sensitive cone cells in the eye in roughly equal amounts. Materials that do not emit light themselves appear white if their surfaces reflect back most of the light that strikes them in a diffuse way. 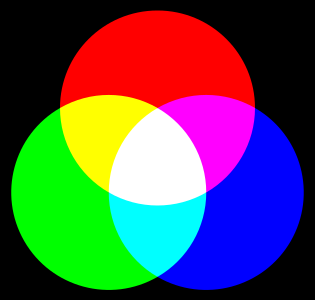 In the RGB color model, used to create colors on TV and computer screens, white is made by mixing red, blue and green light at full intensity. In 1666, Isaac Newton demonstrated that white light could be broken up into its composite colors by passing it through a prism, then using a second prism to reassemble them. Before Newton, most scientists believed that white was the fundamental color of light. White light can be generated by the sun, by stars, or by earthbound sources such as fluorescent lamps, white LEDs and incandescent bulbs. On the screen of a color television or computer, white is produced by mixing the primary colors of light: red, green and blue ( RGB) at full intensity, a process called additive mixing (see image below). White light can be fabricated using light with only two wavelengths, for instance by mixing light from a red and cyan laser or yellow and blue lasers. This light will however have very few practical applications since color rendering of objects will be greatly distorted. The fact that light sources with vastly different spectral power distributions can result in a similar sensory experience is due to the way the light is processed by the visual system. One color that arises from two different spectral power distributions is called a metamerism. Many of the light sources that emit white light emit light at almost all visible wavelengths (sun light, incandescent lamps of various Color temperatures). This has led to the notion that white light can be defined as a mixture of "all colors" or "all visible wavelengths". This widespread idea is a misconception,[ citation needed] and might originally stem from the fact that Newton discovered that sunlight is composed of light with wavelengths across the visible spectrum. Concluding that since "all colors" produce white light then white must be made up of "all colors" is a common logical error called affirming the consequent, which might be the cause of the misunderstanding. The same principle is used in photography and cinematography where the choice of white point determines a transformation of all other color stimuli. Changes in or manipulation of the white point can be used to explain some optical illusions such as The dress. The White Cliffs of Dover take their white color from the large amount of chalk, made of limestone, which they contain, which reflects the sunlight. Many mountains with winter or year-round snow cover are named accordingly: Mauna Kea means white mountain in Hawaiian, Mont Blanc means white mountain in French. Changbai Mountains literally meaning perpetually white mountains, marks the border between China and Korea. Zinc white is made from zinc oxide. 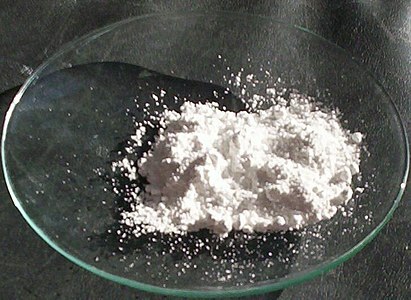 Zinc oxide is used in paints, suntan lotion, and breakfast cereals. Chalk is a kind of limestone, made of the mineral calcite, or calcium carbonate. 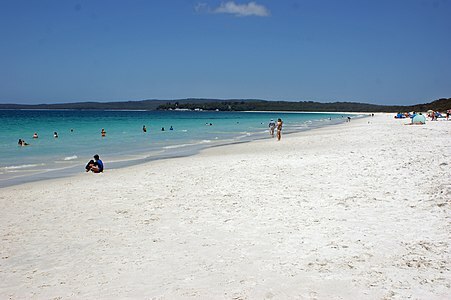 It was originally deposited under the sea as the scales or plates of tiny micro-organisms called Coccolithophore. 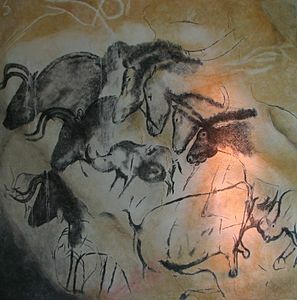 It was the first white pigment used by prehistoric artists in cave paintings. The chalk used on blackboards today is usually made of gypsum or calcium sulphate, a powder pressed into sticks. Zinc white is made from zinc oxide. It is similar to but not as opaque as titanium white. It is added to some breakfast cereals,[ citation needed] since zinc is an important nutrient. 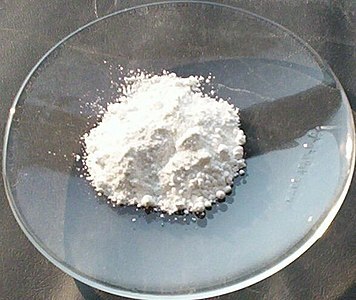 Chinese white is a variety of zinc white made for artists. Some materials can be made to look "whiter than white", this is achieved using optical brightener agents (OBA). These are chemical compounds that absorb light in the ultraviolet and violet region (usually 340–370 nm) of the electromagnetic spectrum, and re-emit light in the blue region (typically 420–470 nm). OBAs are often used in paper and clothing to create an impression of very bright white. This is due to the fact that the materials actually send out more visible light than they receive. Bleaching is a process for whitening fabrics which has been practiced for thousands of years. Sometimes it was simply a matter of leaving the fabric in the sun, to be faded by the bright light. In the 18th century several scientists developed varieties of chlorine bleach, including sodium hypochlorite and calcium hypochlorite (bleaching powder). Bleaching agents that do not contain chlorine most often are based on peroxides, such as hydrogen peroxide, sodium percarbonate and sodium perborate. While most bleaches are oxidizing agents, a fewer number are reducing agents such as sodium dithionite. A white dwarf is a stellar remnant composed mostly of electron-degenerate matter. They are very dense; a white dwarf's mass is comparable to that of the Sun and its volume is comparable to that of the Earth. Its faint luminosity comes from the emission of stored thermal energy. A white dwarf is very hot when it is formed, but since it has no source of energy, it will gradually radiate away its energy and cool down. This means that its radiation, which initially has a high color temperature, will lessen and redden with time. Over a very long time, a white dwarf will cool to temperatures at which it will no longer emit significant heat or light, and it will become a cold black dwarf. However, since no white dwarf can be older than the Age of the universe (approximately 13.8 billion years),  even the oldest white dwarfs still radiate at temperatures of a few thousand kelvins, and no black dwarfs are thought to exist yet. 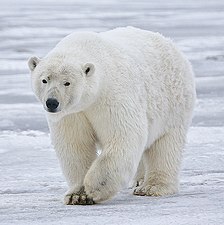 White animals use their color as a form of camouflage in winter. The ermine, or stoat. Once considered the most noble of animals because it would rather die than dirty its fur. Thousands of pilgrims in white gather in Mecca for the beginning of their pilgrimage, or Hajj. Pope Francis at the Vatican. Popes have traditionally worn white since 1566. 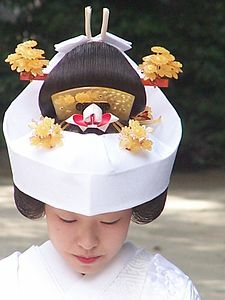 In the Shinto religion of Japan brides traditionally wear a white wedding kimono. 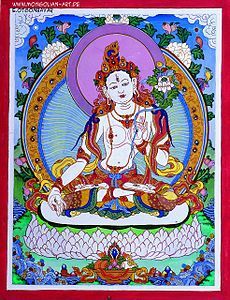 The Buddhist deity Tara is often depicted with white skin. White is an important symbolic color in most religions and cultures, usually because of its association with purity. In the Roman Catholic Church, white is associated with Jesus Christ, innocence and sacrifice. Since the Middle Ages, priests wear a white cassock in many of the most important ceremonies and religious services connected with events in the life of Christ. White is worn by priests at Christmas, during Easter, and during celebrations connected with the other events of the life of Christ, such as Corpus Christi Sunday, and Trinity Sunday. It is also worn at the services dedicated to the Virgin Mary, and to those Saints who were not martyred, as well as other special occasions, such as the ordination of priests and the installation of new bishops. Within the hierarchy of the church, the lighter the color, the higher the rank. Ordinary priests wear black; bishops wear violet, cardinals wear red, and outside a church, only the Pope will wear white. Popes occasionally wore white in the Middle Ages, but usually wore red. Popes have worn white regularly since 1566, when Pope Pius V, a member of the Dominican Order, began the practice. White is the color of the Dominican Order. In Islam, white clothing is worn during required pilgrimage to Mecca, or Ihram pilgrimage ( Hajj). 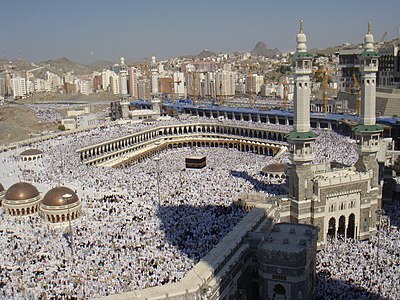 Hajj. Called Ihram clothing, men's garments often consist of two white un-hemmed sheets (usually towelling material). The top (the riḍā) is draped over the torso and the bottom (the izār) is secured by a belt; plus a pair of sandals. Women's clothing varies considerably and reflects regional as well as religious influences. Ihram is typically worn during Dhu al-Hijjah, the last month in the Islamic calendar. 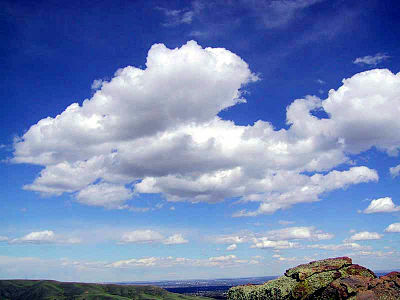 Many religions symbolize heaven by using a sky with white clouds. This phenomenon is not limited to western culture; in Yoruba religion, the orisha Obatala in the Ifá tradition is represented by white. Obatala is associated with calmness, morality, old age, and purity. In some Asian and Slavic cultures, white is considered to be a color that represents death. 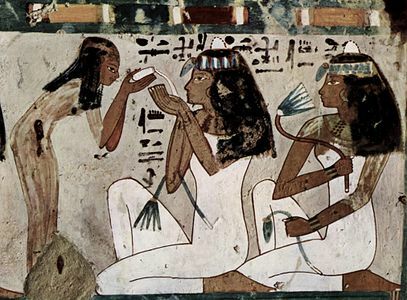 White also represented death in ancient Egypt, representing the lifeless desert that covered much of the country; black was held to be the color of life, representing the mud-covered fertile lands created by the flooding of the Nile and giving the country its name (Kemet, or "black land"). In India, it is the color of purity, divinity, detachment and serenity. In Hindi, the name Sweta means white. 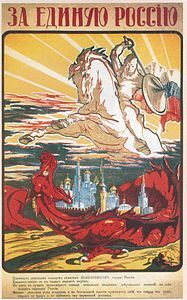 During the Civil War which followed the Russian Revolution of 1917, the White Army, a coalition of monarchists, nationalists and liberals, fought unsuccessfully against the Red Army of the Bolsheviks. 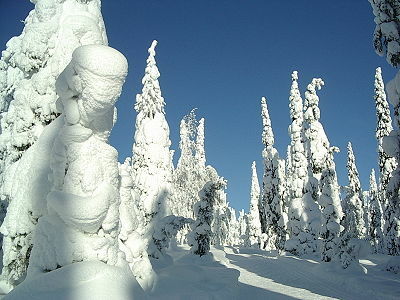 A similar battle between reds and whites took place during the Civil War in Finland in the same period. The Ku Klux Klan is a racist and anti-immigrant organization which flourished in the Southern United States after the American Civil War. 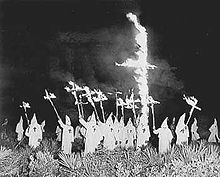 They wore white robes and hoods, burned crosses and violently attacked and murdered black Americans. In Iran, the White Revolution was a series of social and political reforms launched in 1963 by the last Shah of Iran before his downfall. Philippines also use white as their symbol for unity in their flag. White-collar workers are those who work in offices, as opposed to blue-collar workers, who work with their hands in factories or workshops. In Western culture, white is the color most often associated with innocence, or purity. 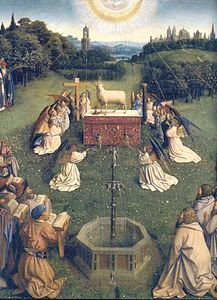 In Biblical times, lambs and other white animals were sacrificed to expiate sins. In Christianity Christ is considered the "lamb of God," who died for the sins of mankind. The white lily is considered the flower of purity and innocence, and is often associated with the Virgin Mary. White is the color in Western culture most often associated with beginnings and the new. In Christianity, children are baptized wearing white, and, wear white for their first communion. 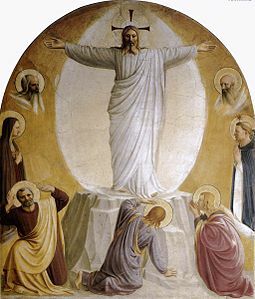 Christ after his Resurrection is traditionally portrayed dressed in white. Eggs, another symbol of the new, are used to celebrate Easter. The Queen of the United Kingdom traditionally wears white when she opens the session of Parliament. In high society, debutantes traditionally wear white for their first ball. White has long been the traditional color worn by brides at royal weddings, but the white wedding gown for ordinary people appeared in the 19th century. Before that time, most brides wore their best Sunday clothing, of whatever color. The white lace wedding gown of Queen Victoria in 1840 had a large impact on the color and fashion of wedding dresses in both Europe and America down to the present day. The Barong Tagalog is a traditional folk costume of the Philippines; this attire is worn on formal gatherings and weddings. In Taoism, white represents the yang or male energy, one of the two complementary natures of the universe. Black and white often represent the contrast between light and darkness, day and night, male and female, good and evil. In taoism, the two complementary natures of the universe, yin and yang, are often symbolized in black and white, Ancient games of strategy, such as go and chess, use black and white to represent the two sides. 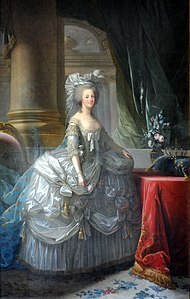 In the French monarchy, white symbolized the King and his power par la grâce de Dieu ("by the grace of God") and in contrast black was the color of the queen who according to the Salic Law which excluded women from the throne (and thus from power) could never become the ruling monarch. In addition many names come from white flowers: Camille, Daisy, Lily, Lili, Magnolie, Jasmine, Yasemine, Leila, Marguerite, Rosalba, and others. Since ancient times, temples, churches, and many government buildings in many countries have traditionally been white, the color associated with religious and civic virtue. 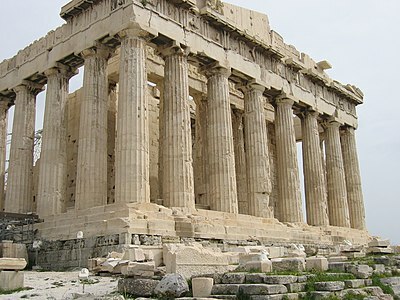 The Parthenon and other ancient temples of Greece, and the buildings of the Roman Forum were mostly made of or clad in white marble, though it is now known that some of these ancient buildings were actually brightly painted. The Roman tradition of using white stone for government buildings and churches was revived in the Renaissance and especially in the neoclassic style of the 18th and 19th centuries. White stone became the material of choice for government buildings in Washington D.C. and other American cities. European cathedrals were also usually built of white or light-colored stone, though many darkened over the centuries from smoke and soot. The Renaissance architect and scholar Leon Battista Alberti wrote in 1452 that churches should be plastered white on the inside, since white was the only appropriate color for reflection and meditation. 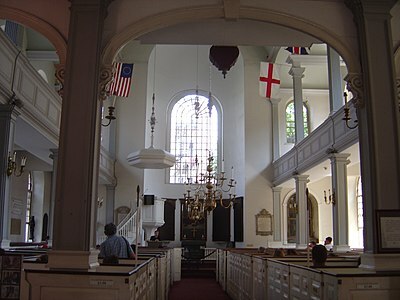 After the Reformation, Calvinist churches in the Netherlands were whitewashed and sober inside, a tradition that was also followed in the Protestant churches of New England, such as Old North Church in Boston. People of the Caucasian race are often referred to simply as white. The United States Census Bureau defines white people as those "having origins in any of the original peoples of Europe, the Middle East, or North Africa. It includes people who reported "white" or wrote in entries such as Irish, German, Italian, Lebanese, Near Easterner, Arab, or Polish." White people constitute the majority of the U.S. population, with a total of 223,553,265 or 72% of the population in the 2010 United States Census. ^ Sanskrit-Lexicon.uni-koeln.de Archived 13 February 2010 at the Wayback Machine (Monier Williams Sanskrit-English Dictionary, p. 1106). ^ OED; Harper, Douglas (November 2001). "Online Etymology Dictionary". Retrieved 26 March 2008. ^ "Pigments through the Ages – Prehistory". Retrieved 30 December 2016. ^ a b Anne Varichon (2000), Couleurs – pigments et teintures dans les mains des peuples, p. 16 . ^ Anne Varichon (2000), Couleurs – pigments et teintures dans les mains des peuples, p. 21. ^ John Gage (1993) Color and Culture, p. 29. ^ Stefano Zuffi (2012), Color in Art, pp. 224–25). ^ Stefano Zuffi (2012), Color in Art, pp. 226–27. ^ Stefano Zuffi, Color in Art, pp. 232–33. ^ John Gage, (1993), Color and Culture, pp. 117–19. ^ Michel Pastoureau (2005), Le petit livre des couleurs, pp. 50–51. ^ Stefano Zuffi (2012), Color in Art, p. 260. ^ Philip Ball (2001), Bright Earth, Art and the Invention of Colour, pp. 484–85. ^ Wyszecki & Stiles. Color Science (Second ed.). p. 506. ^ "Colours of light". Science Learning Hub. Retrieved 4 April 2015. ^ "Color: White Light, Reflection & Absorption". study.com. Retrieved 4 April 2015. ^ a b Convex and non-convex illuminant constraints for dichromatic colour constancy, G.D. Finlayson and G. Schaefer, in Proceedings of the 2001 IEEE Computer Society Conference on Computer Vision and Pattern Recognition. CVPR 2001 http://ieeexplore.ieee.org/abstract/document/990528/ Archived 8 October 2017 at the Wayback Machine "the perceived colour of an object is more or less independent of the illuminant; a white paper appears white both outdoors under bluish daylight and indoors under yellow tungsten light, though the responses of the eyes' colour receptors ... will be quite different for the two cases." ^ a b Program of Color Science / Munsell Color Science Laboratory, Rochester Institute of Technology, Complete Color FAQ. "A perfect mirror reflects all of the light that strikes it... A perfect white also reflects all the light incident on it, but reflects that light diffusely. In other words, the white scatters the incident light in all directions." ^ An Introduction to Appearance Analysis, Richard W. Harold, in GATFWorld, the magazine of the Graphic Arts Technical Foundation, SS Number 84. "The typical reference is a white standard that has been calibrated relative to the perfect white reflecting diffuser (100% reflectance at all wavelengths)." ^ Wyszecki & Stiles. Color Science (Second ed.). Regular reflection (or specular, or mirrorr reflection) follows the laws of optical reflection without diffusion (scattering), as exemplified by mirrors. ^ "Does hue affect the perception of grayness? ", R Shamey, W Sawatwarakul, Sha Fu, 13 May 2014, DOI: 10.1002/col.21894, Color Research & Application, Volume 40, Issue 4, p. 374. http://onlinelibrary.wiley.com/doi/10.1002/col.21894/pdf Archived 8 October 2017 at the Wayback Machine "The usual definition of achromatic color is 'a perceived color without hue.' The colorimetric definition is that of an object with a flat reflectance function at a given level of reflectance, or one of its metamers." ^ "17-12 achromatic stimulus". International Commission on Illumination (CIE). 2014. Retrieved 8 October 2017. ^ "17-1427 white, adapted". International Commission on Illumination (CIE). 2014. Retrieved 4 April 2015. ^ "Why Snow is White (Even Though Water is Clear)". Retrieved 30 December 2016. ^ Survey, U.S. Geological. "USGS Glacier Studies". Retrieved 30 December 2016. ^ "Why Are Clouds White?". Retrieved 30 December 2016. ^ "Pigments through the Ages – Overview – Lime white". Retrieved 30 December 2016. ^ Philip Ball (2000), Bright Earth, Art and the Invention of Colour, p. 99. ^ "Pigments through the Ages – Overview – Titanium white". Retrieved 30 December 2016. ^ "Bleaching". Encyclopædia Britannicah (9th Edition (1875) and 10th Edition (1902) ed.). Retrieved 2 May 2012. ^ Field, Simon Q (2006). "Ingredients – Bleach". Science Toys. Retrieved 2 March 2006. ^ Bloomfield, Louis A (2006). "Sunlight". How Things Work. Retrieved 23 February 2012. ^ Richmond, M. "Late stages of evolution for low-mass stars". Lecture notes, Physics 230. Rochester Institute of Technology. Retrieved 3 May 2007. ^ "Cosmic Detectives". The European Space Agency (ESA). 2 April 2013. Retrieved 26 April 2013. ^ Stellar Spectral Types Archived 2 January 2009 at the Wayback Machine, entry at hyperphysics.phy-astr.gsu.edu, accessed on line 19 June 2007. ^ Empirical bolometric corrections for the main-sequence Archived 9 November 2017 at the Wayback Machine, G. M. H. J. Habets and J. R. W. Heintze, Astronomy and Astrophysics Supplement 46 (November 1981), pp. 193–237, Tables VII and VIII. ^ Eva Heller (2000). Psychologie de la couleur, effets et symboliques, p. 132. ^ Hathaway, Jane (2012). A Tale of Two Factions: Myth, Memory, and Identity in Ottoman Egypt and Yemen. SUNY Press. pp. 96–97. ISBN 978-0-7914-8610-8. ^ Henry Dreyfuss. Symbol Sourcebook: An Authoritative Guide to International Graphic Symbols. ^ Anne Varichon, (2000), Couleurs – pigments et teintures dans les mains des peuples, p. 33. ^ Eva Heller (2000), Psychologie de la Couleur – effets et symboliques, p. 136. ^ Eva Heller (2000), Psychologie de la Couleur – effets et symboliques, p. 84. ^ "Japanese Funeral". Retrieved 30 December 2016. ^ "Japanese Funeral Customs". Retrieved 30 December 2016. ^ Anne Varichon, (2000), Couleurs – pigments et teintures dans les mains des peuples, pp. 16–35. ^  Archived 21 May 2016 at the Wayback Machine, Taoiseach.gov.ie, 2007. Retrieved 22 March 2014. ^ "White Feather". Etymonline.com. Retrieved 6 June 2012. ^ Safire, William (9 November 1997). "On Language; Gimme the Ol' White Shoe". The New York Times. ^ Smith, Douglas (2 October 2012). Former People: The Final Days of the Russian Aristocracy. Macmillan. ISBN 978-1-4668-2775-2. ^ Eva Heller (2000), Psychologie de la couleur – effets et symboliques. ^ Eva Heller (2000), Psychologie de la couleur – effets et symboliques, pp. 135–36. ^ Eva Heller (2000), Psychologie de la couleur – effets et symboliques, p. 137. ^ Stefano Zuffi (2012), Color in Art, p. 254. ^ Codex Sinaiticus Archived 30 October 2013 at the Wayback Machine, Rev 6:8. ^ Henry George Liddell and Robert Scott, A Greek-English Lexicon Archived 6 April 2014 at the Wayback Machine: χλωρός. ^ Eva Heller (2000), Psychologie de la Couleur – effets et symboliques, p. 133. ^ Heller 2000, pp. 133–34. ^ John Gage (1993), Couleur et Culture, pp. 11–29. ^ Stefano Zuffi, Color in Art (2012), p. 244. ^ "The White Population: 2000" (PDF). United States Census Bureau. August 2001. Retrieved 10 March 2011. ^ Stefano Zuffi (2012), Color in Art, p. 256. ^ American Girls Handy Book: How to Amuse Yourself and Others, by Adelia Beard. ISBN 978-0-87923-666-3, p. 369. Heller, Eva (2000). Psychologie de la couleur – Effets et symboliques. Pyramyd (French translation). ISBN 978-2-35017-156-2. Varichon, Anne (2005). Couleurs – pigments et teintures dans les mains des peuples (in French). Editions de Seuil. ISBN 978-2-02-084697-4. Ball, Philip (2001). Bright Earth – Art and the Invention of Colour. Penguin Group. ISBN 978-2-7541-0503-3. Wikimedia Commons has media related to White.